The main components of the duo band ‘’Astra The 22’s” is a Latvian singer/songwriter Kerija Kaleja, who has studied music and music business and worked in New York’s music industry, now living and working in Latvia, and the American singer/multi-instrumentalist Eric Jayk. 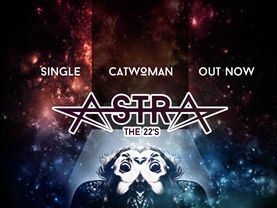 Astra The 22’s encompasses styles of indie pop, indie dance that are combined with rock influences and elements. Kerry has highly valued Eric’s talent and experience in music from his previous projects, such as Wildstreet. After a while, Kerry and Eric found out that they like similar music and that they are on the same wavelength musically, where it is enough for one of them to say a line or play a chord, so that the other one gets the idea, the creative direction and the music advances into a whole song. The song has been recorded and mixed in New York with Eric Jayk and Kyle Kelso. Master of the song has been made by Howie Weinberg, who has received 4 Grammy nominations, 200 Gold albums in the US and worked with major acts like The White Stripes, Nirvana, Red Hot Chili Peppers and others.